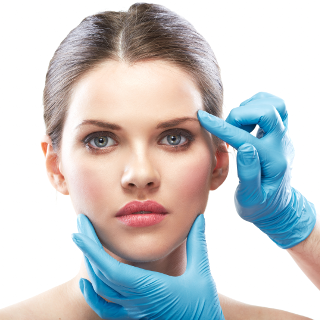 Here is some great information on noninvasive facial rejuvenation options. Noninvasive facial rejuvenation has many different modalities. There are many options to choose from, however, in my practice four procedures that I have really enjoyed doing include CO2 lasers, Kybella, which is deoxycholic acid for removal of the fat underneath the chin as well as percutaneous collagen induction therapy known as CIT and radiofrequency energy which we offer in the office in the form the Viora reaction laser. The CO2 laser started in the late 1980s. Before that mechanical dermabrasion and chemical peeling were done, but CO2 lasers were a more advanced form of ablation of the skin of the face resulting in tightening. The carbon dioxide laser wavelength is approximately 10,600 nanometers. This is strongly absorbed by water, which is abundant in the skin. The carbon dioxide lasers do have a narrow zone of thermal necrosis, which seals the dermal blood vessels and lymphatics and also results in minimal scarring. The carbon dioxide lasers completely remove the epidermis and part of the dermis just like chemical peels and dermabrasion. However, CO2 lasers can go deeper resulting in the better effects. However, this does require anesthesia in the form of sedation in the operating room; however, the results are much better than peels or dermabrasion. The treatment with the carbon dioxide laser does result in wound remodeling as well as new collagen and elastin fiber formation resulting in healthier, firmer, and tighter skin. The carbon dioxide lasers must be evaluated for each patient on individual basis. I used the Obagi skin classification system. The carbon dioxide laser is only for patients with lighter skin and skin that is not too thick or too thin and skin that is not too fragile. It is excellent to treat fine lines and wrinkles. It is not good for deep furrows. For deep furrows, you can get a face lift followed by the carbon dioxide laser, which does result in outstanding results. Carbon dioxide lasers are excellent for photoaging in order to treat actinic keratosis, solar elastosis, telangiectasias, or mottled hyperpigmentation. The carbon dioxide lasers are also good for acne scars, rhinophyma, sebaceous gland hyperplasia, and microcystic acne. If you do have a history of cold sores, you can still get carbon dioxide laser therapy, you just need to be on antiviral medications two days before the procedure and afterwards until reepithelialization takes place. You cannot get carbon dioxide laser if you have an active infection or unrealistic expectations. It is also important to make sure you tell your doctor if you have recently used Accutane or had a recent deep resurfacing procedure. It is also not recommended in patients that form keloids. Carbon dioxide lasers also require laser safety in the operating room. This involves turning off nasal canula oxygen using proper smoke evacuation. It is also important when we use prep that we use antibacterial soap only, we do use metal eye shields to protect the eyes coated with eye ointments. The face is also surrounded with wet, sterile towels and the teeth and the endotracheal tube with foil to reduce the chance of any enamel damage. Again, with the carbon dioxide and lasers anesthesia is either general anesthesia or IV sedation. Several passes are used with the carbon dioxide laser. The first pass removes the entire epidermis. This can turn the skin white. I rehydrate the skin and wipe it dry. In the second pass the pattern is oriented 90 degrees and then you enter the papillary or the upper reticular or mid reticular dermis and this is the goal for carbon dioxide laser therapy. This can be then rehydrated and the third passes are for advanced photodamage or acne scars. The endpoint for carbon dioxide lasers include ablation of the wrinkles or you can get a 60-80% reduction possibly. The safety endpoint is a chamois yellow skin color that persists after wiping with a saline soaked gauze. It is important to avoid aggressive lower lid resurfacing to avoid scleral show and ectropion. I give oral antibiotics, antivirals, and pain meds after the carbon dioxide laser therapy. Oral steroids are okay, if you do have a lot of swelling. It is important not to pick the skin after this laser to avoid making any scars. I also recommend Aquaphor until re-epithelization, which takes one to two weeks and you can re-treat after six months; however, most patients require one treatment once every few years. The most common complications are scarring and hypopigmentation. You can do a carbon dioxide laser therapy with a facelift on the non-undermined skin, which is around the mouth and the nose. It is okay to do a superficial TCA chemical peel over the undermined skin to avoid any demarcation if you do carbon dioxide laser therapy with a facelift. The results can be fantastic. You can remove a significant amount of the wrinkling and get a much tighter appearance to the face.